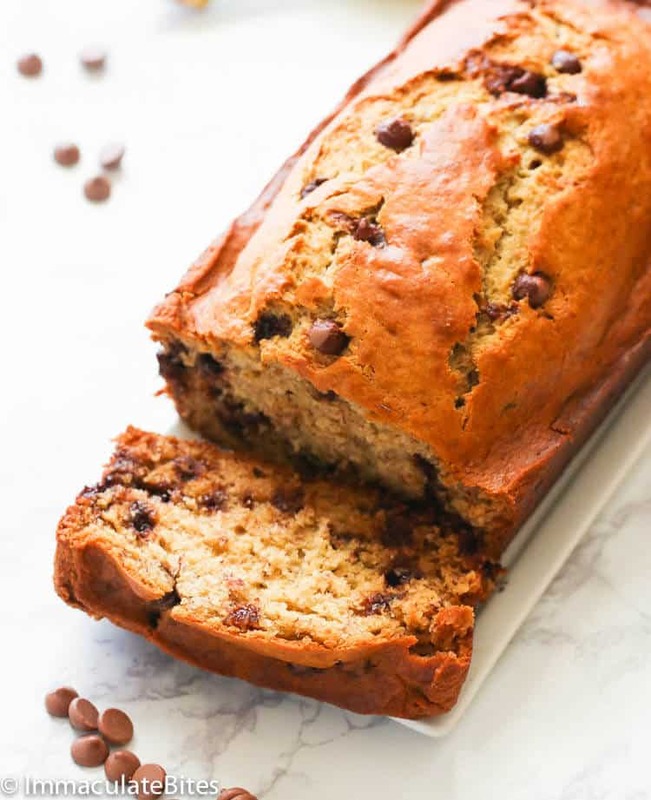 Chocolate Chip Banana Bread – a super easy and moist banana bread perfect for anytime of the day prepared in just 5 minutes. NO MIXER required and it’s studded with chocolate chips. You’ll never have any bananas to go to waste! What can I add to make it a moist banana bread? I don’t know about you, but I prefer my banana bread to be moist and soft on the inside with a beautiful crusty outer layer. Now you ask , “how can I make a moist banana?”. Well, it’s easier than you think it is. First, you have to stop throwing those overly ripe bananas in the trash. Those black speckled bananas, makes a great natural sweetener to breads and cakes and they make any bread moist. Second, gently fold in the wet ingredients to the dry ones for a tender texture. Aside from that, adding sour cream or yogurt to your baked goods also helps in tenderizing the crumb. And lastly, melted butter. That hint of buttery flavor is just a must on every bread (for me) and it helps the bread to have a longer shelf life. 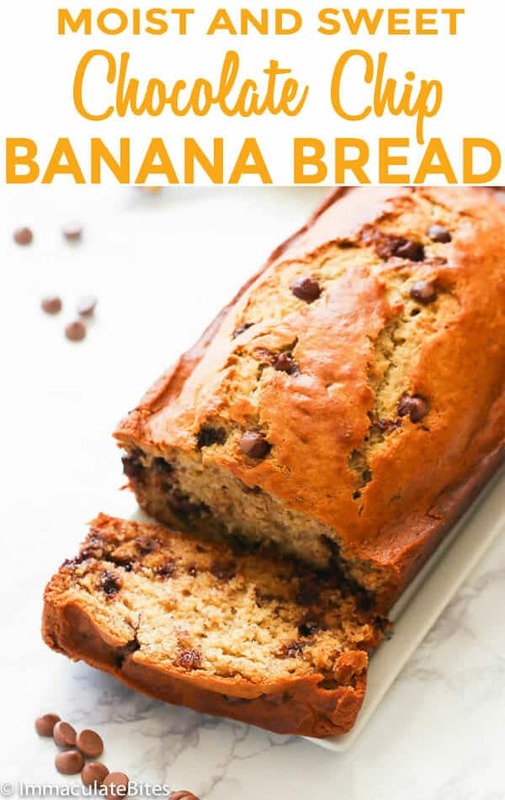 Can I substitute oil for butter in a chocolate chip banana bread recipe? For this recipe, I added a melted butter since I love that buttery flavor on breads, however, you can always replace it with oil. Like butter, oil helps prolong the shelf life of baked products and it adds texture, moisture and flavor. Canola, sunflower, coconut oil and other vegetable oil makes a great substitution for butter. But I prefer to use canola oil more when substituting butter. 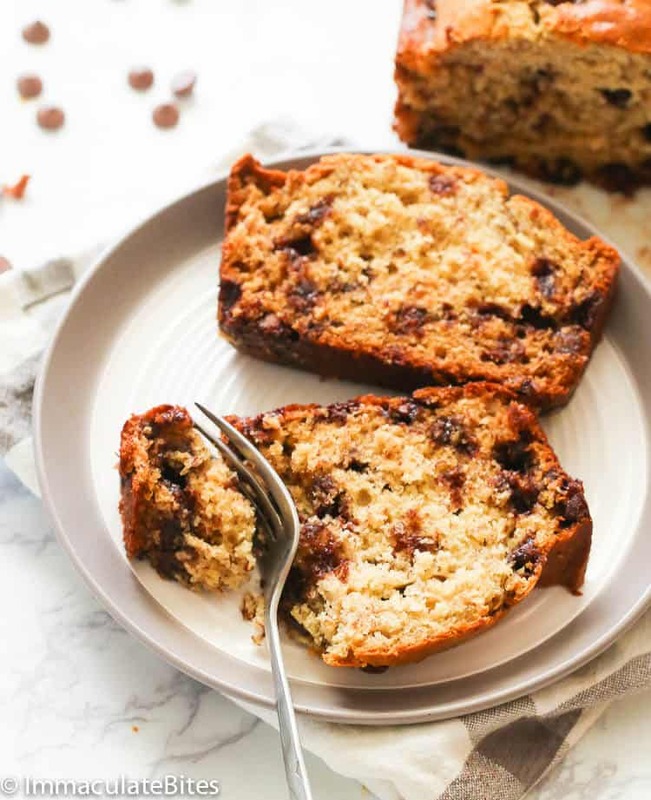 Seriously..Who could dare turn down a good slice of this chocolate chip banana bread? Not me. Aside from its perfect texture and flavor, let’s not forget those studs of sweet chocolate chips. On the other hand, you can also use half toffee bits and half chocolate bits for variation. 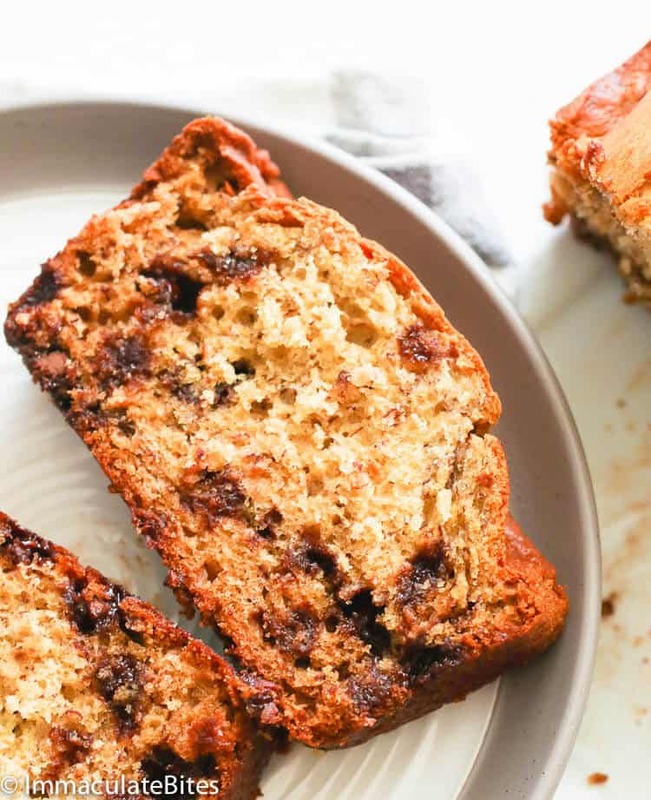 Moreover, you can also switch things up a bit with your favorite banana bread. You can add them with nuts like this Caribbean Banana Nut Bread OR some pineapple bits like this Pineapple Banana Bread here. 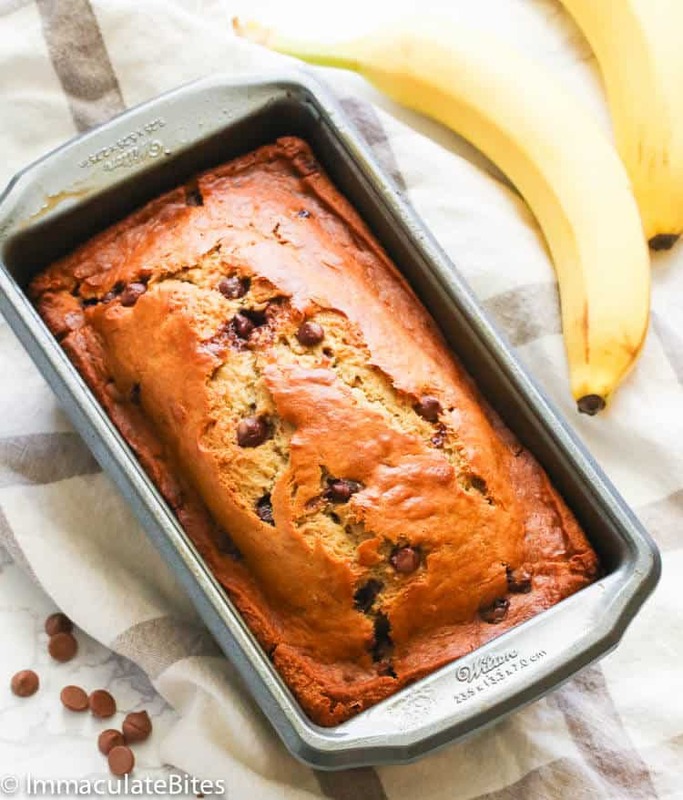 If you’re bananas are a little green and you want them to ripe quickly for this chocolate chip banana bread recipe, you can place them in a baking sheet and bake at 250 F for 15-20 minutes depending on the ripeness of the banana you wish to use. Or you can place a whole bunch of bananas in a paper bag in a room temperature. 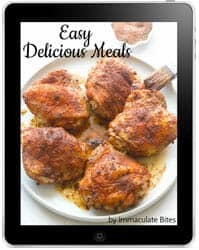 You could have this moist, easy and super delish comfort food for breakfast, lunch and as afternoon snacks. Who could complain? No sour cream? You can substitute it with Greek yogurt, plain yogurt or buttermilk. You may substitute the all-purpose flour with cake flour or wheat flour, though there’d be slight difference with the texture. 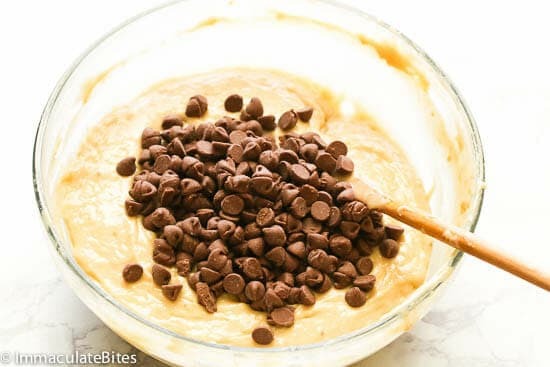 For variation, you can mix toffee bits with the chocolate chips. Store baked bread tightly and refrigerate for up to 3-4 days. You can also top this with Cream Cheese Frosting if you’re into frosting. You can get my cream cheese frosting HERE. 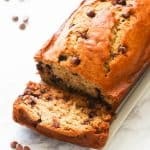 Chocolate Chip Banana Bread - a super easy and moist banana bread perfect for anytime of the day prepared in just 5 minutes. NO MIXER required and it's studded with chocolate chips. You'll never have any bananas to go to waste! Preheat oven to 350 degrees. Grease a loaf with baking spray; set aside. 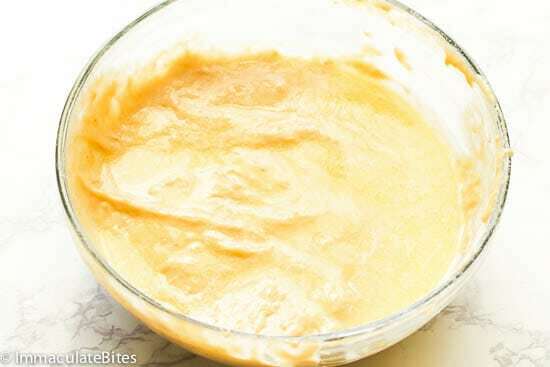 In a small bowl whisk together eggs, mashed bananas, sugar (brown and white) sour cream and vanilla. 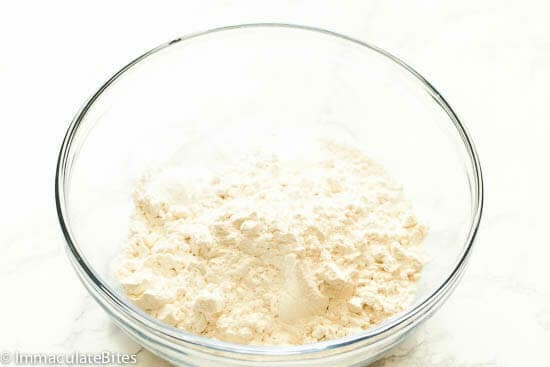 In another bowl combine flour, baking powder, baking soda, and salt. 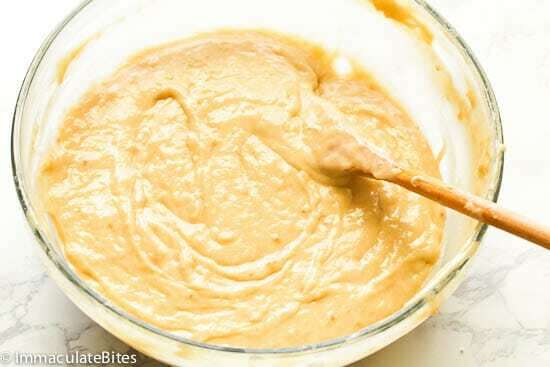 Gradually add wet ingredients to the bowl of dry ingredients and whisk with a spatula until thoroughly mixed. Pour in melted butter and thoroughly mix , then fold in the chocolate chips. Scrape down sides. 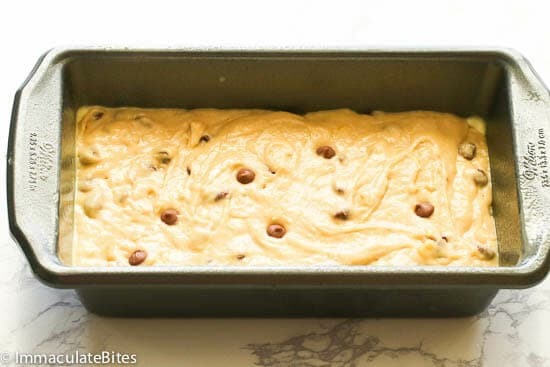 Pour mixture into prepared loaf pan – bake for about 55-65 minutes, or until a toothpick inserted comes out clean. Let it rest for 10 minutes before serving. Preheat oven to 350 degrees. Grease a loaf with baking spray; set aside. 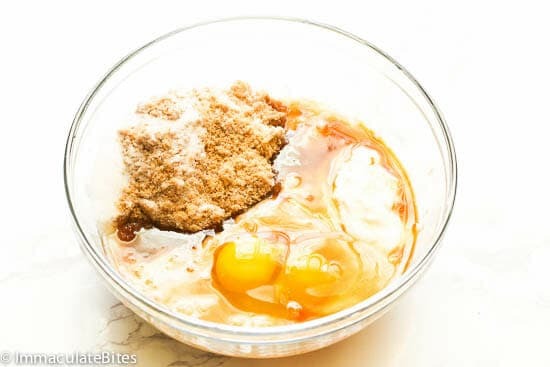 In a small bowl whisk together eggs, mashed bananas, sugar (brown and white) sour cream and vanilla. 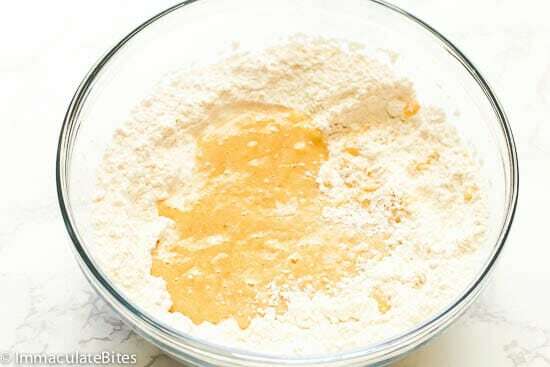 Gradually add wet ingredients to the bowl of dry ingredients. And whisk with a spatula until thoroughly mixed. Pour in melted butter and thoroughly mix. Then fold in the chocolate chips. Scrape down sides. Pour mixture into prepared loaf pan – bake for about 55-65 minutes, or until a toothpick inserted comes out clean. Let it rest for 10 minutes before serving. Hi, Christine. I would usually go for Greek yogurt. But either of them works fine. 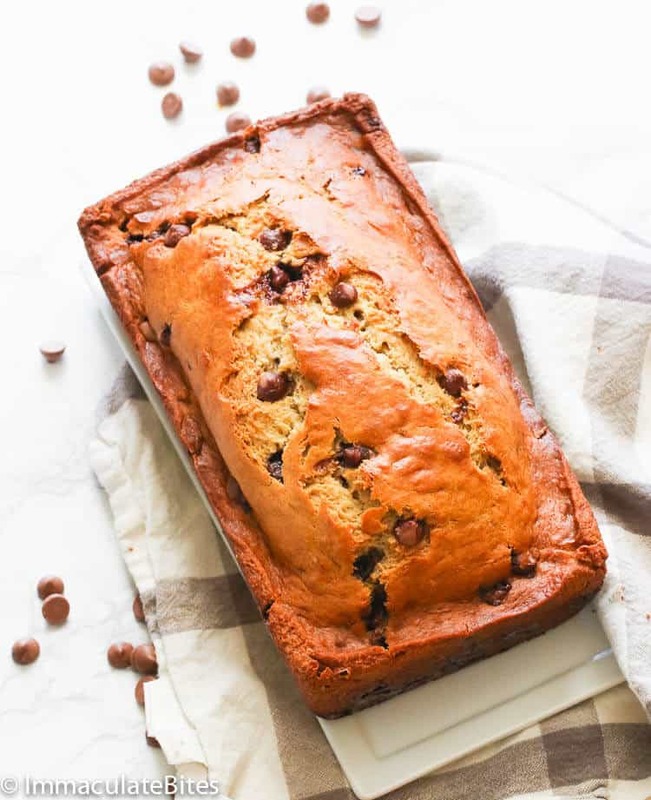 Do you have recipe for chocolate banana bread? Or please help me with the amount of chocolate for this recipe. We do love it, too, especially my son. So happy to hear it worked out well for you Juliet. Another hit in my house. Made it this weekend and it was delicious. With a subtle taste of banana and warm chocolate. Very moist. wie lecker ist das denn – habe das Rezept gleich ausgedruckt – Morgen gehe ich Bananen kaufen .